Panda 4.0 represents a change to Google’s search algorithm that audits more than 200 factors when determining the quality of a given website or page. The Panda 4.0 updates were developed to further filter out low-quality websites and those with “thin content” (Myles Anderson, SEL). Since 2011, Panda’s algorithm has been refreshed or updated 25 times (according to Search Engine Land). Panda 4.0 set its paws on sites with thin onsite content or “doorway pages,” which are “large groupings of thin content pages that are optimized for a specific keyword to rank then funnel users to a specific destination” (support.google.com). What was the impact on B2B websites? Quality Link: An industrial transportation website specializing in products and services for the public transportation industry has a link listed within the Bus sub-category section to a (client) website specializing in providing graphic solutions for transit systems. 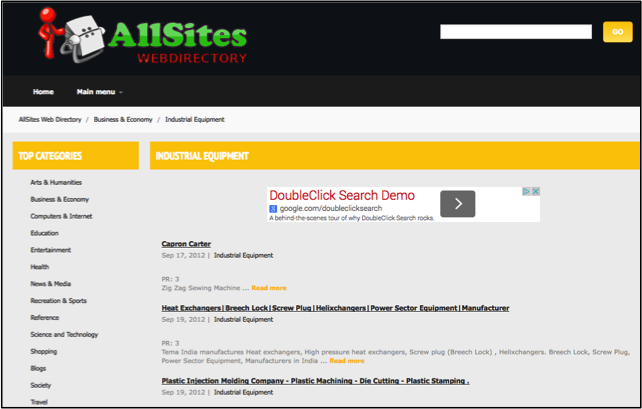 Questionable Link: An industrial manufacturing website specializing in injection molding has a link listed on a sub-par directory website that is heavy on links and low on content. The website includes categories across a wide range of verticals which signifies a lack of focus and quality. Google and other search engines classify these types of links as “low-quality” and detrimental to a websites link portfolio. The first example displays a quality link that is listed on an industry specific website within a targeted niche category that aligns with the website. The second example displays a listing on a random directory website, which is grounds for Google Panda 4.0 penalizing your website. To combat these types of questionable links, it is important to research and find link opportunities that are specific to your industry and your target audience. Ensure your B2B website has quality and unique content that provides value to your readers. The content should be educational and provide useful information to specific audiences across the industries you serve. Dedicate time and effort in researching the behaviors of your customer base. What types of websites are they interacting with and how are they interacting with your website? Are they completing a desired action? Analyze value by reviewing your website’s analytics and conversion metrics. Focus on unique and high quality content: post original articles and content on your website. Avoid copying text or automatically generated content. Replace doorway pages with robust content pages that include descriptive content and relevant links to improve the user experience and naturally drive them to your product pages (ensure product page copy is unique and follows similar principles). Ensure users are engaging with your website. For example, is your bounce rate or time on site improving? Are users sharing or commenting on your content? If so, then it is a signal of authority to Google. At a high level, Panda 4.0 is all about promoting valuable content with an authentic and highly qualified B2B SEO strategy. This has been a consistent theme spanning the history of the Panda updates. It’s important to continually evaluate your website and content strategy to ensure your specific content is unique and provides value to the user. This latest update showcased the detrimental impact to websites that do not follow this principle.